The overall goal of this procedure is to successfully resect a portion of bone from the rib of a mouse. The procedure was developed as a model to study large-scale long bone repair. 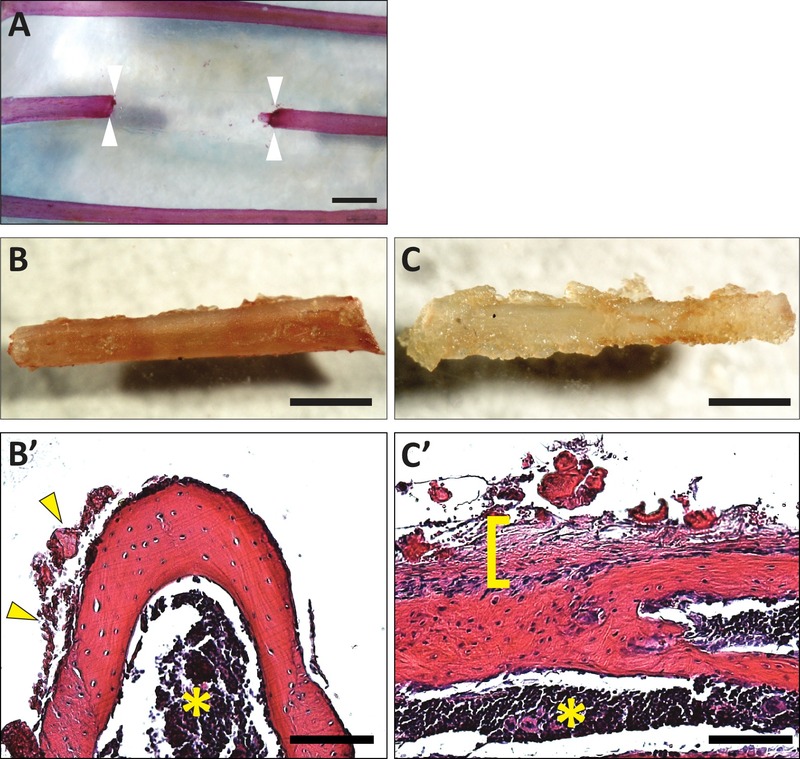 Tripuraneni, N., Srour, M. K., Funnell, J. W., Thein, T. Z., Mariani, F. V. A Surgical Procedure for Resecting the Mouse Rib: A Model for Large-Scale Long Bone Repair. J. Vis. Exp. (95), e52375, doi:10.3791/52375 (2015). This protocol introduces researchers to a new model for large-scale bone repair utilizing the mouse rib. The procedure details the following: preparation of the animal for surgery, opening the thoracic body wall, exposing the desired rib from the surrounding intercostal muscles, excising the desired section of rib without inducing a pneumothorax, and closing the incisions. Compared to the bones of the appendicular skeleton, the ribs are highly accessible. In addition, no internal or external fixator is necessary since the adjacent ribs provide a natural fixation. The surgery uses commercially available supplies, is straightforward to learn, and well-tolerated by the animal. The procedure can be carried out with or without removing the surrounding periosteum, and therefore the contribution of the periosteum to repair can be assessed. Results indicate that if the periosteum is retained, robust repair occurs in 1 - 2 months. We expect that use of this protocol will stimulate research into rib repair and that the findings will facilitate the development of new ways to stimulate bone repair in other locations around the body. Debilitating skeletal injury, chronic osteoarthritis, and the severe problems associated with reconstructive surgery impact economic productivity, family well-being, and quality of life. While small breaks and lesions can heal fairly well, humans are not capable of repairing large defects and therefore must rely on reconstructive procedures to restore structure and function. Reconstruction may involve allogeneic or heterogeneic grafts, morcellized bone, implanted scaffolds, or distraction osteogenesis. Unfortunately, not only are there persistant morbidity factors associated with these treatments but the original strength of the repaired bone is rarely attained. Thus, new clinical approaches are needed. One-way to develop innovative methods to treat segmental defects is to study situations in which large-scale repair occurs naturally. Amphibians famously can regenerate skeletal elements, while mammals are considered limited in this ability. However, since the early part of the 20th century, a few reports of regeneration in the human rib have been published suggesting that humans may not be so limited1-4 . Currently this phenomenon is best known by plastic surgeons who use rib material for jaw, face and ear reconstruction, but it is not more broadly appreciated5. In order to study this repair in more detail, we have developed a surgical model using the mouse. Using this protocol, researchers can identify the innate factors involved and use this information to facilitate skeletal healing in other locations. There are many advantages to using the ribs as a model for studying skeletal repair. First, the surrounding ribs provide a natural fixator (as compared to resection of the femur6,7). This decreases the morbidity risk of internal and external fixators and simplifies the surgical procedure. Secondly, the thin muscular layers of the chest wall provide for easy access and excellent visibility which make the assay comparable to the convenience of calvarial resections8. Thirdly, in contrast to the calvariae which form by intramembranous ossification, the ribs form by endochondral ossification and grow in length via extension at growth plates located at either end of a central diaphysis. Therefore, repair of the ribs may be more comparable to repair of the long bones of the appendicular skeleton. Furthermore, we have found that compared to the femur, the periosteum of the rib is thicker and can be more easily manipulated. Thus, investigators who wish to assay bone repair for the purpose of studying the periosteum or testing cell therapies, pharmacological agents, and/or tissue scaffolds may find this surgical model useful. In summary, this rib resection model provides a context within which to study natural large-scale bone repair in mammals as no such model in general use currently exists. NOTE: All procedures are in accordance with an animal protocol approved by the Institutional Animal Care and Use Committee (IACUC) at the University of Southern California. Lay out the necessary surgical tools and supplies (sterilized, items 1 - 18 in Materials list) and arrange a dissecting microscope and a fiber optics trans-illuminator in a hood or on a downdraft table. Place a sexually mature mouse (20 - 30 g, 1 - 3 months old) in an induction chamber with 4% isoflurane to induce anesthesia. Confirm anesthesia with a paw and/or tail pinch test. Apply ointment to the mouse’s eyes to avoid eye dryness during the surgery. Move the mouse to the microscope stage. Place the mouse into the nose cone of the maintenance hose and position laterally. Provide a warming pouch adjacent to the animal to help maintain body temperature. NOTE: Position of the mouse is dependent on personal preference and/or handedness of the surgeon., either left or right side is fine. Adjust isoflurane to 2 - 3% for maintenance, and watch breathing rate. Inject buprenorphine (0.05 mg/kg) subcutaneously (lateral flank of the leg) for post-surgery pain with a 25 G needle. The leg may twitch which is a normal response. Detect the desired rib by palpation, and clear the area of hair with a shaver. NOTE: Ribs 8-10 are recommended since ribs 1-7 are closer to the lungs and 11-13 are considerably shorter. Counting the ribs should begin with the most rostral rib as number 1. Prepare the area with alternating povidone-iodine and isopropanol (70%) swabbing (3x is often recommended by animal use protocols). Cut a 2 cm incision through the skin, directly above and parallel to the desired rib with medium sized microsurgery scissors. Incise through the underlying muscle and fat layers. Place all 3 layers (skin, muscle, fat) into a retractor to expose the surgical area, while minimizing the size of the incision. Cut through the intercostal muscles overlying the desired section of rib with a 5.0 mm scalpel. Position this incision around 5 mm proximal to the chondrocostal joint as this is where the rib is not as highly curved. Carefully separate the muscle from the bone with fine tip forceps. To create a resection while retaining the periosteum in the animal, cut through the periosteum, along the length of rib with a 5.0 mm scalpel. Carefully separate the periosteum from the underlying bone laterally with fine tip forceps. Proceed with caution, as the periosteum is very delicate and has a gelatinous consistency. Next make a cross-section through the bone at one end with fine micro-scissors. If needed, measure the resection with a reticle in the microscope or a ruler type gauge. Then carefully lift the bone out of the periosteum and cut the other end. NOTE: Proceed with caution. This is the most delicate step, as pulling up without excising the rib below will tear the pleural membrane and result in a pneumothorax. If the pleural membrane is torn this will be readily evident as the interior of the thoracic cavity will become visible. If bleeding occurs as a result of cutting the bone, apply pressure at the cut end with a cotton-tipped swab for 4 - 5 sec to stop the bleeding. NOTE: On the rare occasion that bleeding continues, it may be necessary to stop and euthanize the animal as significant blood loss will compromise recovery (without fluid replacement, the maximum blood volume which can be safely be lost is 10% of the total blood volume or 7.7 - 8 µl/g. For a 25 g mouse, this is equivalent to around 180 - 200 µl9). Immediately place the removed rib into 4% PFA for future analysis. NOTE: If the resection of both the bone and the periosteum is to be carried out, omit the periosteum incision and separation (step 3.2). Since the periosteum is very tightly attached to the pleural membrane proceed cautiously, teasing the rib away from the pleural membrane with forceps to avoid tearing. Suture the intercostal muscles over the top of the remaining periosteal sleeve with 9-0 sutures (2 sutures are usually sufficient). Place the sutures directly above the cut ends of the rib, to act as indicators for surgery location. Remove the retractor. Suture the overlying muscle and fat with 9-0 sutures (3 - 4 sutures are usually sufficient). In mice with particularly thick layers of muscle and/or fat, suture each layer separately (e.g., 1 layer of sutures for the muscular layer and 1 layer of sutures for the fatty layer). Close the skin with 7-0 sutures (4 - 5 sutures are usually sufficient). Secure the incision with suture glue, pinching the edges together with large forceps. Slowly wean the mouse off isoflurane by first adjusting to 1% for few minutes and then turn off. Place the mouse under a heat lamp and leave until consciousness is regained, 5 - 10 min. After consciousness is regained and throughout the healing period, the mouse should move and ambulate normally and show no signs of distress. Provide post-operative pain management including the administration of buprenorphine in an oral gelatin form at 0.5 mg/kg every 12 hr for 48 hr. Oral administration does not require restraining the animal which might cause pain to the thoracic region. Maintain the mouse in a cage with free access to food and water during the healing period. After the incision is dry, female animals can be co-housed while males must remain isolated to prevent fighting. After the healing period, follow the approved procedure for euthanasia. Remove the rib cage for fixation and analysis. Animals typically recover quickly from this procedure, the incision heals well, and the animals exhibit normal behavior. The procedure uses commercially available supplies and after practice, can be completed in under 1 hr. Before using this procedure to generate experimental data, it is important to analyze the resection at the day 0 time point to determine if any large bone fragments might remain within the resection zone. One way to assess proper procedure is to assess the animals by X-ray or microCT imaging postoperatively, although this will typically require special radiation safety approvals. Instead, another simple assessment can be completed by carrying out a skeletal staining preparation as illustrated in Figure 1A. This involves collecting the rib cage, fixing it in EtOH, and staining with alizarin red using a standard protocol11. It can be useful to omit the potassium hydroxide (used to digest away the soft tissues) so that the sample can still be used afterwards for histological analysis if so desired. The sample can still be visualized without the potassium hydroxide steps by clearing in 80% glycerol because the overlying body wall muscle layer is thin. Or alternatively, these muscles can be removed manually prior to fixation/staining as is shown here (Figure 1A). The portion of bone removed can also be analyzed. If the goal was to retain the periosteum in the animal, the bone portion should have a smooth surface as visualized by light microscopy and histological analysis (Figure 1B, B’). A bone portion removed with the periosteum should have a distinctly ragged surface and upon histological examination have an intact overlying periosteal layer, which has the characteristics of a dense irregular connective tissue (Figure 1C, C’). Depending on the goal of the experiment, healing can be assessed at different time points. Observations indicate that 3 mm resections in which the periosteum is retained in the animal typically heal completely within 1 - 2 months. Repair occurs via the formation of a soft and hard callus, and remodeling. An example of complete repair at 2 months is shown in Figure 2A, A’; repair can be assessed by skeletal preparation (Figure 2A) and histological analysis (Figure 2A’). If the periosteum is also removed, the resection gap is never filled in. Figure 2B shows an example in which some repair has occurred at one end, however, it is more typical to observe blunt ends. Upon histological analysis, the resection zone is filled with adipose, granulation tissue, and muscle (Figure 2B’). Figure 1. Example images of resections at day 0. (A) Illustration of a rib resection (4.5 mm) collected immediately after surgery. No bone fragments are left behind. Sample was stained with alizarin red (using a standard protocol but omitting any steps with potassium hydroxide to preserve the sample for future histological analysis) and cleared in 80% glycerol. Arrowheads indicate the location of the cut ends. (B) Removed rib portion from rib cage depicted in (A) without the periosteum attached. (B’) Histological section showing minimal periosteum attached to the bone (yellow arrowheads, left) and no periosteum to the right (cross section, stained with hematoxylin and eosin). The yellow asterisk indicates the bone marrow cavity. Mouse ribs do not have extensive trabeculae. (C) Removed rib portion showing the periosteum still attached. (C’) Histological section showing the intact periosteum overlying the bone indicated by a yellow bracket (longitudinal section, stained with hematoxylin and eosin). A yellow asterisk indicates the bone marrow cavity. Scale bars: A, B, C = 1 mm; B’,C’ = 100 μm. Please click here to view a larger version of this figure. Figure 2. Rib repair post-healing in resections with and without the periosteum. (A) Skeletal preparation following ~2 months of healing after resection, retaining the intact periosteum inside the mouse (prepared as in Figure 1A). Complete repair of the region can be observed. (A’) Histological section of B showing a restoration of the lamellar bone walls and the bone marrow cavity (hematoxylin and eosin). (B) Skeletal preparation (alizarin red) following ~3 months of healing after removing both a rib portion and the surrounding periosteum. There was only minimal repair at the cut end shown at the left of the panel. A yellow arrowhead points to the chondrocostal joint. (B’) Histological section of B showing granulation tissue, adipose, and muscle cells filling in the site of resection (hematoxylin and eosin). Scale bars: A, B = 1 mm; B’ = 500 μm; C’ = 200 μm. Please click here to view a larger version of this figure. When first learning this protocol, determining where to locate the initial incision can be challenging. However, practice on euthanized mice helps the surgeon learn where to place the initial incision and expose the desired rib to be resected. Working on cadavers also improves the fine-motor skills required to remove the rib portion with or without the periosteum. In addition, someone new to this procedure might find manipulating the fine tools and thin sutures to be difficult. While tying off, excess pulling on the suture can tear the tissues. Thus, some practice suturing also on cadavers could be helpful. Finally if the surgeon is new to surgical procedures with rodents, it may be useful to have another person assist with monitoring and adjusting the anesthesia during the first few surgeries. The most critical step of this protocol is excising the bone without inducing a pneumothorax (an abnormal collection of air in the pleural space), which is difficult to treat in the mouse since the pleural membrane is too thin to close surgically. The layer of muscle and parietal pleura inferior to the rib is very thin and delicate; hence, precise movements are required to prevent a puncture in the pleural membrane that lies beneath the resection area. This occurs most commonly in steps 3.1 and 3.3. In step 3.1 (separating the bone from the surrounding intercostal muscles), the sharp scalpel and forceps will easily pierce the pleural layer if the point is not kept superficial. In step 3.3 (excising the bone with fine micro-scissors), the placement of the scissors beneath the bone may overcome the tensile strength of the pleural membrane, or the action of breaking the bone may cause the end of the bone fragment to perforate the pleural membrane. We have found that using fine micro-scissors that have a curved tip is beneficial. In addition, as above, it can also be useful to first practice the protocol on euthanized mice. Ultimately, however we have found that this problem can be easily overcome with patience and practice. Although the rib is an endochondral bone, there may be some potentially important differences between the rib skeleton and the long bones of the appendicular skeleton. From an embryological perspective, the rib skeleton is derived from a different mesodermal compartment (somite) than the appendicular skeleton (lateral plate mesoderm)12. Thus it is possible that there are properties that are unique to the rib skeletal progenitors that reflect this difference in developmental history. Therefore, in the long-run, it may be necessary to determine what these unique properties are and then use this information to encourage the progenitors in the limb skeleton to mediate repair with the same facility as seen in the rib. Another aspect that comes into play concerns the location of the ribs in relation to the respiratory system. Although the flanking ribs provide sufficient stability around the resection such that no external fixator is needed, the repair zone is under the constant movement and strain of lung inflation/deflation. It has been recognized that during bone repair, too much movement can be inhibitory to healing while some movement appears to be important for generating a cartilage intermediate13,14. At this point, it is not clear, however it is possible that formation of a cartilage intermediate may be a key step for effective large-scale repair. Thus, movement of the ribs during respiration might facilitate repair (when the periosteum is left behind in the animal). Since movement may be particularly important in this context, developing a method to place a fixator could be useful for studying the biomechanical influences on repair in the future. By carrying out a rib repair assay in the mouse, one can take advantage of powerful genetic tools that have been developed. For example, using transgenic marks, the origin of the repair cells can be assessed. Transgenic reporters for bone formation (interesting new tools in development from Gazit et al.15,16), the endochondral process, and the read-out of important signal transduction pathways can be utilized12,17. In addition, mice carrying loss-of-function alleles could be used to determine the signaling pathways required. Currently, no other vertebrate model organism allows such a wide variety of genetic techniques to probe the basic underlying biology of this process. In addition, while other excellent models for skeletal repair have been developed and have been in use for some time, another context to test scaffolds, compounds, and cell therapies considering the features of rib repair may be beneficial. The establishment of a standard rib repair model complements existing models as the ribs are not required to support the body and repair occurs without stabilization. In addition, the contribution of the periosteum to repair can be easily assessed. Futhermore, because the rib has both cartilage and bone segments, comparisons between the healing of these different but related tissue types may identify a common feature of effective repair18. We thank members of the Mariani lab for critical reading of the manuscript. Our funding sources were: the Baxter Medical Scholar Research Fellowship (to M.K.S. ), USC undergraduate fellowships and the Provost, Dean Joan M. Schaeffer, and Rose Hills Fellowships, (to M.K.S.). We also acknowledge a CIRM BRIDGES fellowship through Pasadena City College (to T.T.T). and the James H. Zumberge Research and Innovation Fund, the USC Regenerative Medicine Initiative, and the NIAMS NIH under Award Number R21AR064462 (to F.V.M). Philip, S. J., Kumar, R. J., Menon, K. V. Morphological study of rib regeneration following costectomy in adolescent idiopathic scoliosis. Eur Spine J. 14, (8), 772-776 (2005). Munro, I. R., Guyuron, B. Split-rib cranioplasty. Ann Plast Surg. 7, (5), 341-346 (1981). Taggard, D. A., Menezes, A. H. Successful use of rib grafts for cranioplasty in children. Pediatric neurosurgery. 34, (3), 149-155 (2001). Head, J. R. Prevention of Regeneration fo the Ribs: A problem in thoracic surgery. Archives of Surgery. 14, (6), 1215-1221 (1927). Kawanabe, Y., Nagata, S. A new method of costal cartilage harvest for total auricular reconstruction: part I. Avoidance and prevention of intraoperative and postoperative complications and problems. Plastic and reconstructive surgery. 117, (6), 2011-2018 (2006). Cheung, K. M., et al. An externally fixed femoral fracture model for mice. Journal of orthopaedic research : official publication of the Orthopaedic Research Society. 21, (4), 685-690 (2003). Matthys, R., Perren, S. M. Internal fixator for use in the mouse. Injury. 40, Suppl 4. S103-S109 (2009). Cooper, G. M., et al. Testing the critical size in calvarial bone defects: revisiting the concept of a critical-size defect. Plastic and reconstructive surgery. 125, (6), 1685-1692 (2010). Ask the Vet. JAX NOTES. 499, Available from: http://jaxmice.jax.org/jaxnotes/archive/499c.html (2005). Flecknell, P. A., Roughan, J. V., Stewart, R. Use of oral buprenorphine ('buprenorphine jello') for postoperative analgesia in rats--a clinical trial. Laboratory animals. 33, (2), 169-174 (1999). Rigueur, D., Lyons, K. M. Whole-mount skeletal staining. Methods in molecular biology. 1130, 113-121 (2014). Evans, D. J. Contribution of somitic cells to the avian ribs. Developmental biology. 256, (1), 114-126 (2003). Colnot, C., Thompson, Z., Miclau, T., Werb, Z., Helms, J. A. Altered fracture repair in the absence of MMP9. Development. 130, (17), 4123-4133 (2003). Lu, C., et al. Cellular basis for age-related changes in fracture repair. Journal of orthopaedic research : official publication of the Orthopaedic Research Society. 23, (6), 1300-1307 (2005). Zilberman, Y., Gafni, Y., Pelled, G., Gazit, Z., Gazit, D. Bioluminescent imaging in bone. Methods in molecular biology. 455, 261-272 (2008). Pelled, G., Gazit, D. Imaging using osteocalcin-luciferase. Journal of musculoskeletal. 4, (4), 362-363 (2004). Elefteriou, F., Yang, X. Genetic mouse models for bone studies--strengths and limitations. Bone. 49, (6), 1242-1254 (2011). Srour, M. K., et al. Natural large-scale regeneration of rib cartilage in a mouse. J. Bone Miner. (2014).